Jesus faces God’s enemy and ours, the one who has hated us from the beginning. This would be a strange order of events if we didn’t understand that just as Jesus identified Himself with His brothers in baptism, He was also identifying with them in facing the test of His love for the Father. Our First Reading recounts the original test of man in the Garden of Eden. There a “cunning” serpent questioned the authority of God’s Word. “Did God really tell you not to eat from any of the trees of the Garden?” We are surprised that God allowed His enemy into the Garden in the first place. Clearly the serpent wanted the humans dead. Through lies (“You will certainly not die”) and distortions of the truth, he seduced them into sin. Why would God give His enemy this opportunity? 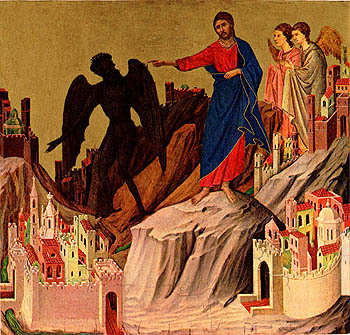 In the Second Reading, St. Paul explains what the two accounts of temptation mean for us. Adam’s transgression meant death for us all. The choice he made was for himself and all his children. Are we tempted to think that isn’t fair? If so, we need to read on, because St. Paul shows us that just as Adam’s disobedience, in which we had no personal part, was counted for us, so Jesus’ obedience, in which we likewise had no personal part, also counts for us. Sometimes we’re tempted to think we should each be given our own shot at obedience, that we could perhaps have done a better job than Adam. That could be dangerous, however. If we refuse to let another’s behavior count for us, what happens if, in our one moment of glory, when we must choose for or against God, we botch it like Adam did? If he could fail, so could we. If we refuse to let another’s behavior count for us, then Jesus’ obedience won’t help us at all. We are left with our own choices and no chance for redemption. God’s way is much better! This entry was posted in Lent, Sunday Lectionary Readings, Year. Bookmark the permalink.